These are excerpts from an investigation carried out by The International Consortium of Investigative journalists and Centre for Investigative Journalism Nepal. 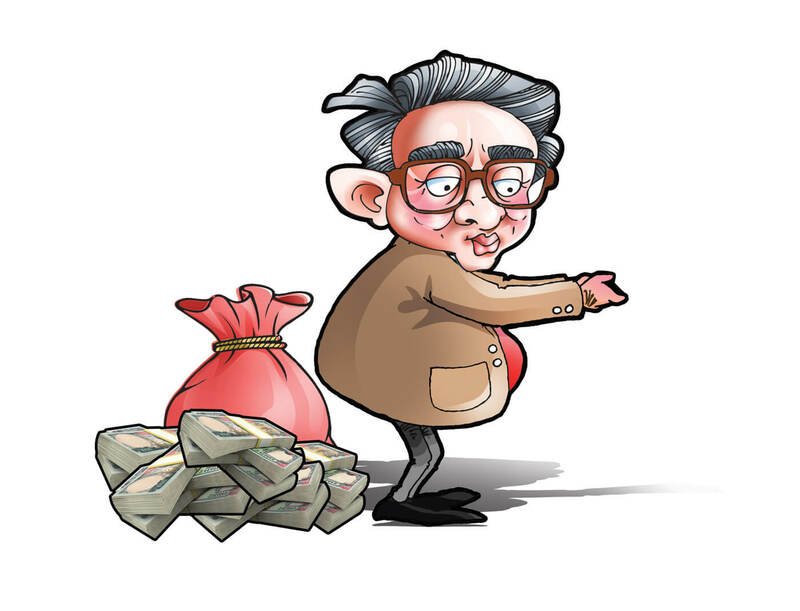 In February 2015 The International Consortium of Investigative journalists (ICIJ) revealed that Nepalis held Rs5 billion in secret Swiss bank accounts. Most people thought the money must have been parked there by Nepal’s corrupt politicians. 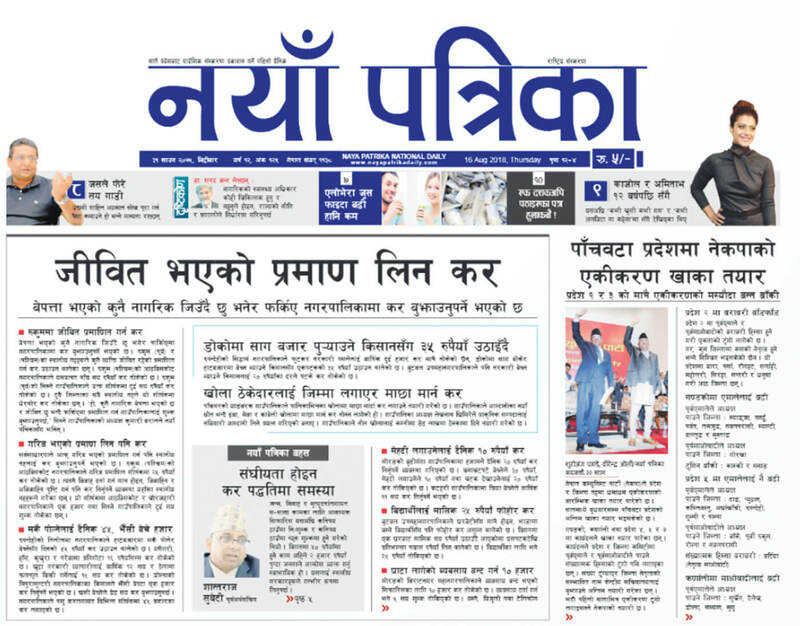 But after the Centre for Investigative Journalism Nepal (CIJ Nepal) went through 3,000 pages of documents from Swiss Leaks, Offshore Leaks, the Panama and Paradise Papers, the names were of Nepal’s top business people. Even foreigners had deposited money in the banks using Nepali addresses and documents. Savings of Nepalis in the banks have now crossed Rs50 billion, email correspondence between CIJ Nepal and Swiss banks show. The records also reveal that Nepalis started to deposit money in Swiss banks the year after the Maoist insurgency began in Nepal in 1996. Nepalis had Rs1.25 billion in the Swiss National Bank in 1996, but that figure doubled to Rs4.1 billion by 2006, when the war ended. Nepalis deposits in the two years after the conflict declined to Rs3.9 billion. Records show that Nepali have withdrawn Rs 15.6 billion from Swiss banks so far. The biggest Nepali depositers in a Swiss bank are Minu Shah Chhibber, and her two sons who live in the UK. They had Rs2.6 billion in Swiss banks in 2006-7. Even some foreigners are found to have used Nepali documents to deposit their money in Swiss banks, including an Israeli national using a Nepali passport to open an account with ‘Kathmandu’ as his address. Other account holders who have Nepal connections are Indians. Despite it banking secrecy laws, an agreement between the Swiss government and the European Union in 2015 after the Swiss Leaks ends the exclusive confidentiality, and the Swiss agree to provide account details if demanded. The ICIJ says Swiss banks have profited from dictators, corrupt politicians, business persons who evade taxes and organisations that make money through the illegal transaction of weapons and drugs by allowing them to deposit their earnings. The country with the biggest Foreign Direct Investment (FDI) in Nepal is not China, India or the United States as one may presume, but the tax haven state of the British Virgin Islands. Of the total Rs137.67 billion received as FDI in the last two decades, the share of the British Virgin Islands (BVI) accounts for 45%. They obtained approval from the Nepal government to invest in and establish industries worth Rs8 billion. In 2017, the Panama Papers revealed that seven Nepalis including Upendra Mahato, the founder of Non-resident Nepalis Association, had invested in tax haven states. The ICIJ and CIJ Nepal collaborated in digging more into these investments, and found that Nepali businesses have used tax havens to evade taxes in Nepal or to transfer the illegally earned money to launder it. The money was then repatriated to Nepal under foreign direct investment (FDI). Investigations show that Birendra Mahato, a former lawmaker and central committee member of Federal Socialist Forum party, his elder brother Upendra Mahato, Niraj Govinda Shrestha, a non-resident Nepali and Ajeya Raj Sumargi, a businessman, are involved in this elaborate money laundering scheme. They used the sale of the telecom company Ncell to avoid paying capital gains tax in Nepal. After a G-7 Summit established the Financial Action Task Force on Money Laundering (FATF) to combat money laundering and terrorist financing the Paris-based organisation has been blacklisting countries. The FATF blacklists countries not cooperating in anti-money laundering financing. Nepal committed to abide by the criteria drawn up by the FATF and its Asia-Pacific Group in 2012 and passed the Money Laundering-related Act. However, given these revelations, there is still a possibility that Nepal could be blacklisted in future. “While Nepal avoided the scrutiny and monitoring criteria of the global community in 2014 due to legislation and institutional reforms, there has not been effective implementation of the laws,” states Finance Minister Yuba Raj Khatiwada’s white paper on the economy last March. 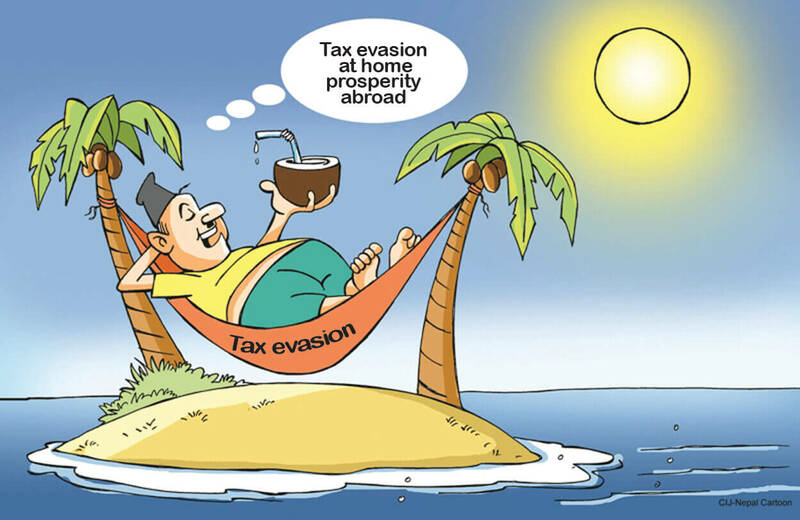 Nepali companies have also dealt with Mossack Fonseca, the intermediary law firm in BVI that helps businesses to want to launder their money by finding them legal loopholes in tax haven countries. In 2015, the ICIJ published details of the firm in the Panama Papers, after which it closed down. Panama Papers emails show that in 2008 Nepal’s Milap Group approached Mossack Fonseca to bid for a tender from the Nepal Supreme Court calling for an international consultant for Judicial Mapping and Judicial Assessment for a project on legal and judicial reforms. Milap Group emailed to Mossack Fonseca proposing to jointly apply for the tender, which a Mossack Fonseca official declined, saying the two could collaborate in future. Milap Group has been involved with foreign companies printing excise stickers for Inland Revenue Department, bank notes for Nepal Rastra Bank and passport printing and supply of Ministry of Foreign Affairs. Another company linked to Mossack Fonseca is Nepal Ventures registered in BVI. It is not clear from the Panama Papers who was listed as the owner, but a company with a similar name is registered at the Office of Company Registrar in Nepal with Dhanusha lawmaker Juli Kumari Mahato as main investor. The company has 20 percent share capital investment in United Telecom Limited. Mahato is the wife of Raghubir Mahaseth, Minister of Physical Infrastructure and Transport and sister of Upendra Mahato and Birendra Mahato. When asked, Juli Kumari Mahato denied having investments abroad, and said “it is a mere coincidence” that a company with similar name existed in the British Virgin Islands. 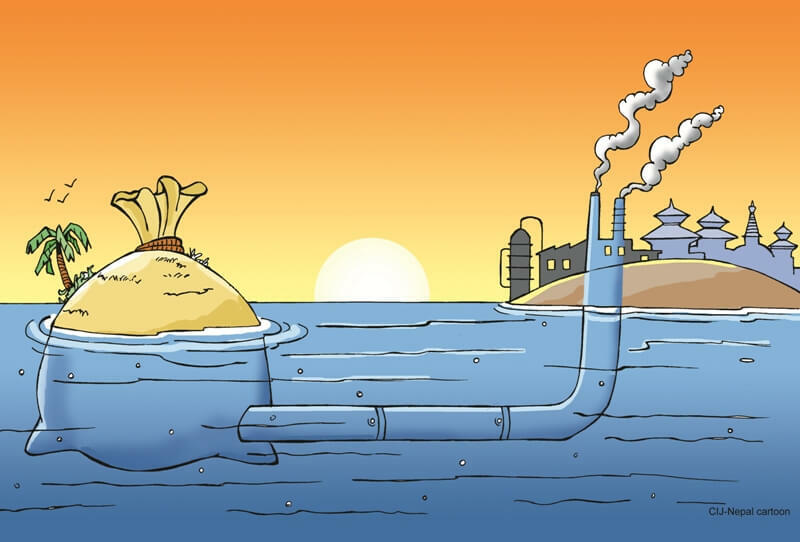 The ICIJ and CIJ-Nepal investigations have also shown how money is laundered from tax havens into Nepal as Foreign Direct Investment (FDI). Records show that the Saurabh Group chaired by Bishnu Prasad Neupane, brought foreign investment from the BVI to build a hotel in Bhaktapur, but construction was stopped after Madhyapur Thimi Municipality found the 17-storey building only had permission for a five-floor structure. Saurabh Group brought the investment for the hotel from the BVI-based Global Technology and Trademark Company, and the Rs1.94 billion proposal was approved by the Department of Industry in 2013. Sulav Agrawal is the director of four companies under the Saurabh Group and brought Rs300 million in FDI from a UAE-based company to manufacture soap and betel nuts in Birganj. Agrawal is also vice-chairman of Shankar Group, but the UAE company has the same name as the one based in the BVI: Global Technology and Trademark which was also found to be evading taxes in its ventures in Parsa district. Krishna Holdings Ltd of Hong Kong has a 45% stake in Sarbottam Cement Pvt Ltd of Nawalparasi, also run by the Saurabh Group. The remaining 55% shares are owned by Neupane and his relatives. Just like how Global Technology and Trademark is operating out of not just the UAE but also the BVI, the Hong Kong-based Krishna Holdings is related to the UAE-based Krishna International. Krishna International Ltd has mentioned on its website that it has invested in as many as 22 countries including Nepal, Mauritius and Cyprus. Ramesh Kumar Sawarthia has brought Rs29.5 million from Hong Kong to build a commercial complex in Gyaneswor, Kathmandu in 2005. The British Virgin Islands-based Global Technology and Trademark has also invested Rs 240 million in the printing and lamination sector. This company has no Nepali partner, but Saurabh Group’s Jagadamba Synthetic and Quality Roto Packaging is also in the printing and lamination business. Four companies in which Saurabh Group’s Neupane has invested, have benefitted from Nepal’s controversial tax settlement policy which allowed them to get away with paying just 3.45% of the total taxes due to the state after a Commission formed by Finance Minister Ram Sharan Mahat in 2015 waived payments. The CIJ Nepal Nepal investigation based on the Paradise Papers leaks obtained by the German paper Süddeutsche Zeitungin 2017 also unearthed links between Nepal’s Laxmi Cement and tax havens in the BVI, the Isle of Man, Seychelles as well as two Indian investors. Shareholders of Laxmi Cement are also involved in KEPY Cement Udyog of Dhading and Ghorahi Cement of Dang. The Act Restricting Investment Abroad, 1964 bars Nepalis from investing in a foreign country, but the ICIJ and CIJ-Nepal investigation found that 55 Nepalis have invested in foreign countries which includes well-known captains of industry in Nepal and non-resident Nepalis. Although the law does not bar NRNs from investing abroad, but there are questions about their offshore companies. Former lawmaker Birendra Mahato, who is currently a central member of the Sanghiya Samajbadi Forum-Nepal, has invested in the ‘OJSC Amkodor Holding Limited Company’ in Belarus with his brother Upendra and another overseas Nepali Niraj Govinda Shrestha, and a foreign partner Romeo Abdo, who also happens to be linked to the Ncell tax-evasion case. 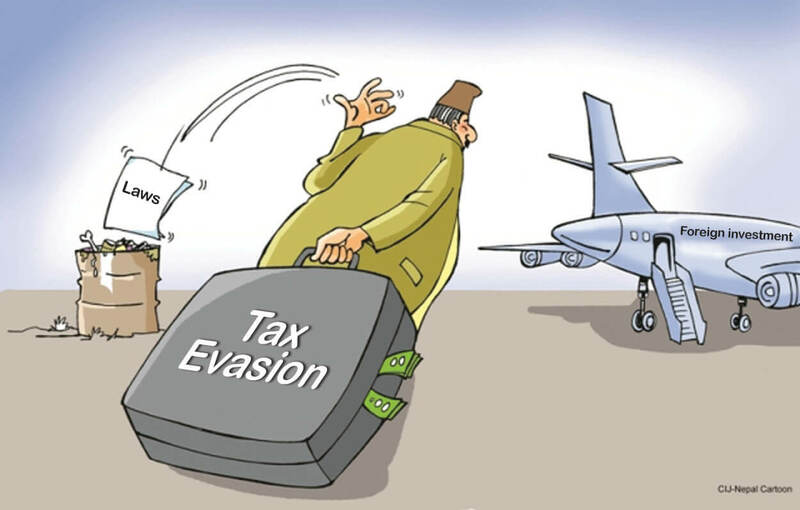 Abdo, who is of Lebanese origin has been doing business in Belarus, represented the TeliaSonera in Ncell in whose ownership transfer of nearly Rs61 billion (the amount has reached Rs 72 billion now) was implicated in evading Nepal’s capital gains tax. Birendra Mahato admitted having the investment seven years ago, but not anymore, and denied knowing Abdo.